The Beauty Buff Blog: Beauty Buff Trend Watch: Bamboo! I knew Butterstick and I had something in common! Butterstick aka Tai Shan aka the love of my life is of course the baby panda who was born in The National Zoo a few years ago. Ok small tangent: He was nicknamed Butterstick because soon after he was born he was described as being no bigger than a stick of butter! Precious!! 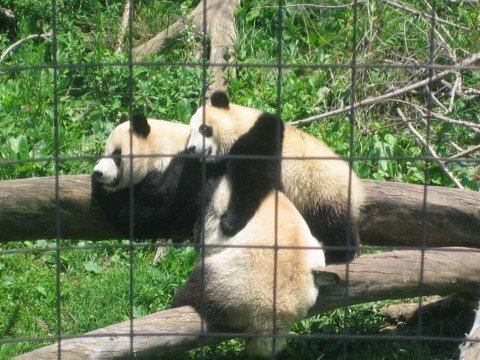 He was officially named Tai Shan 100 days after his birth in accordance with Chinese tradition but to me he'll always be known as Butterstick aka Butterball aka the cutest thing that ever happened! Ok, I'm done! Anyway, I guess pandas have been ahead of the curve all along because the latest beauty trend I've seen hitting the shelves lately is Butterstick's diet staple: bamboo! Bamboo has long been used for a variety of purposes. Indians also believe it has strong Ayurvedic (traditional Indian medicinal) purposes. One of the elements found in the stem of the bamboo is believed to be a tonic for respiratory diseases. So, it should come as know surprise that this multifunctional ingredient has plenty of beauty benefits as well. Not only is it used to make the packaging of our favorite products, but it's now being used in them too! Best of all, the fast growing root can be cultivated and replenished with minimal impact on the environment, therefore officially making it an eco-friendly must-have! also noticed how well is absorbs oil and gives me a matte finish but still looks dewy on. I'm seriously in love people! The actual compact, which has a mirror and brush in a swivel case is sold separately. The brand is hoping to encourage and emphasize a philosophy or re-use and renewal. With the refills being a mere $9.95, I'm ok with subscribing to that philosophy as well! The shades come in Light Bronzer, Medium Bronzer and Bronze. Available in drugstores. This invigorating scrub ($28.00, Naturopathica.com) is made up of micro-ground Bamboo which sloughs the outer layer of skin, and extracts of Sugar Cane, Citrus and Apple which penetrates your pores for a deeper exfoliation. The smell of zesty Lemongrass combined with exotic scents like Mimosa and Jasmine makes this scrub a seriously refreshing and much needed morning boost. The fab line has a variety of quality brushes, each with super soft bristles constructed from high quality non-animal derived taklon fibers, which provide anti-bacterial protection and a flawless application. The handles are all constructed from bamboo and their stems made from recycled aluminum. 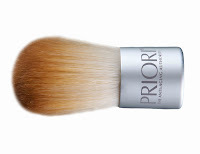 I've been using the Kabuki Brush ($20.00, www.prioriskincare.com) lately. It's the perfect size for powder foundation applications and blending my under eye concealer on. The hair brands latest 'poo and conditioner ($8.00, drugstores) features a combination of avocado, bamboo and grapeseed for silky smooth strength. Pantene's Nature Fusion line uses naturally derived ingredients like bamboo to keep hair looking radiant and damage-free. I haven't tried this yet but am intrigued! Bamboo extract is one of the richest know source of natural silica, which is key for hair growth and hair loss prevention. The serum works naturally to help make your lashes grow longer and thicker! Besides letting the serum dry on your lashes, you can maintain your usual eye makeup routine, making this easy and convenient. The price tag is a bit hefty at $76.00 but well worth it, if the results are gorgeous looking lashes.